Home » Birth Trauma » “I was told I was going to have a big baby….” And then what happened? “I was told I was going to have a big baby….” And then what happened? What followed was a fascinating discussion. Information was shared from lots of different quarters, and evidence was linked to. Experienced birth practitioners shared their views and a few themes started to appear. All along I knew I was intending to write up the discussion as a blog post so I was trying to keep up with the information and understand what was being said. As I opened up links to studies, trials, journal articles and so on my heart sank as I am not the best at analysing that kind of thing and it seemed at first glance that the evidence shared was somewhat contradictory. So I was concerned that I would end up inadvertently talking rubbish in this post. And then I realised that this is exactly the problem. I am a woman of childbearing age who has had an education to degree level, English is my first language and I discuss birth and maternity pretty much every day. When we talk about informed choice we mean sharing all of the evidence plus the benefit of experience with pregnant women and their families, so that they can go through it and make their own decisions. Yet if I were writing this today as a woman who had been told she was likely to have a “big” baby I would be confused. And a little scared. So it’s a good job I didn’t know any of this when I confidently went on to give birth to my 8lbs 13oz son on all fours on our bathroom floor. Let’s pretend for a moment that I am in my third trimester and have been told by my midwife that she suspects baby is going to be a big ‘un. Probably a bouncing 9lbs tot. 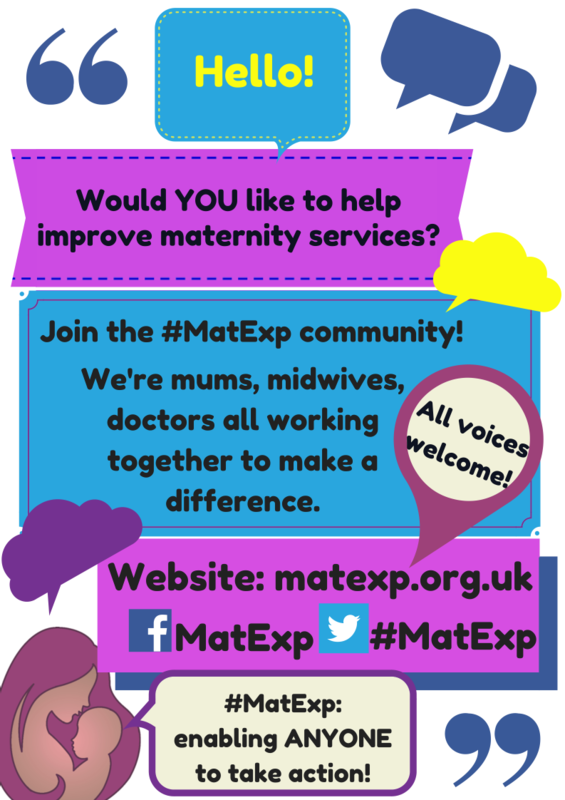 Before I go down the route of “doing” anything about that, or amending my birth plans, I have asked the #MatExp group for some information. What have I discovered? Well, firstly we need to know a little bit more about this fictitious me. Do I have gestational diabetes? Am I classed as overweight? No? Okay then, we can stick with our issue being only the predicted size of my baby and keep questions of GD and BMI for another day if we may. Similarly, we will assume that I am physically able. So why are people sucking their teeth and looking concerned that baby might be of a generous size? “Shoulder dystocia remains an unpredictable obstetric emergency, striking fear in the hearts of obstetricians both novice and experienced. While outcomes that lead to permanent injury are rare, almost all obstetricians with enough years of practice have participated in a birth with a severe shoulder dystocia and are at least aware of cases that have resulted in significant neurologic injury or even neonatal death. This is despite many years of research trying to understand the risk factors associated with it, all in an attempt primarily to characterize when the risk is high enough to avoid vaginal delivery altogether and prevent a shoulder dystocia, whose attendant morbidities are estimated to be at a rate as high as 16–48%. The study of shoulder dystocia remains challenging due to its generally retrospective nature, as well as dependence on proper identification and documentation. As a result, the prediction of shoulder dystocia remains elusive, and the cost of trying to prevent one by performing a cesarean delivery remains high. While ultimately it is the injury that is the key concern, rather than the shoulder dystocia itself, it is in the presence of an identified shoulder dystocia that occurrence of injury is most common. Ah, okay. So whilst MOST cases are not a problem, when there is a problem it can be very serious. And most experienced obstetricians will have seen this happen, inevitably influencing their perception of the risks involved. The teeth sucking is a bit more understandable now. Apparently if I have a small pelvis it is more likely that baby will get his shoulders stuck. How do you know if you have a small pelvis? Small compared to what or whom? I have no idea but it appears to be a consideration. 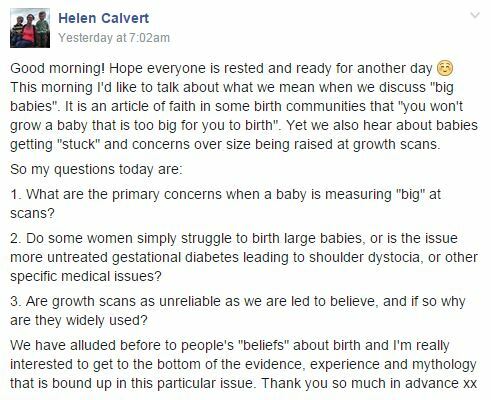 One birth professional observed that “to me that ‘big’ is subjective in a lot of cases. A 7lb baby could be big to one woman whereas a 10lb baby could be average to another. There needs to be far more than just the picture provided by a (often inaccurate) scan. Woman’s own birthweight for example, her stature etc.” It was mentioned that pelvimetry used to be widely used but has been abandoned in favour of scans, due to a Cochrane review that found these measurements did more harm than good. I suspect as with so many birth choices, women are likely to get the reassuring language from midwives who have confidently dealt with many instances of stuck shoulders, and more wary language from obstetricians who have seen first hand what can go tragically wrong. So in summary shoulder dystocia is more likely in bigger babies but on the whole it can’t be predicted and can usually be dealt with. It turns out that there are arbitrary cut offs for recommending Caesarean to prevent SD – 5kg in a non-diabetic woman. That means nothing to me but a quick Google tells me that is an 11lbs baby. My hypothetical nine pounder doesn’t warrant an automatic recommendation for a c-section then. So far so good. But what position is my baby in? This is an important factor. I would argue that all pregnant women should be aware of foetal positioning and how to optimise it, but in this case it is particularly important as a malpositioned big baby could cause trouble. Let’s assume though that I have been on spinningbabies.com, haven’t been reclining on the sofa, have been doing headstands for nine months or whatever it is that is recommended. Baby is now head down and engaged and we’re ready for the off. At this point it’s good to know that there is no evidence to suggest that it hurts more to give birth to a big baby. I cannot comment as my firstborn is the only child I have birthed vaginally so have nothing to compare it to. But the midwives on the group have been reassuring that being predicted a “big” baby does not mean increased pain in labour. Good stuff. Which begs the question, how do we identify the potential 11lbs babies who “require” a c-section birth? So I haven’t allowed anyone to worry me further with a most likely inaccurate scan reading. We think baby is going to be big but not so big that I am going to be encouraged to have an elective c-section, so I’m happy to go ahead with my vaginal birth. This is where we come to the issue that dominated the discussion. The position that women labour in can make a HUGE difference to the outcome when they are birthing a large baby. Labouring on their back is most likely to be unhelpful. Labouring on all fours is most likely to enable them to birth without intervention. Certainly my experience – I could not bear to be in any position other than kneeling up for my entire labour, simply could not bear it. Lying down was absolutely out of the question. Let’s recap. My midwife has said that it is her experienced opinion that I am going to have a big baby. I have declined a growth scan but we are both confident that baby won’t be topping 11lbs. So we’re going for a vaginal birth, and have done everything we can to ensure baby is in a good position. I am then being encouraged to be active in labour, labour on all fours and so on. There is no reason to believe that I will experience more pain due to baby’s size. 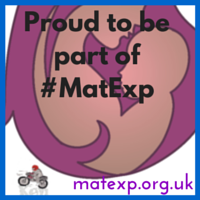 There is an elevated risk of shoulder dystocia but my birth team are trained to deal with that. Hmm, okay, on reflection I would make the same choice I made back in 2011 when I hadn’t had this conversation. Home waterbirth with experienced midwives please! Especially, for me as an individual, “big” babies are normal – I was 9lbs 11oz at birth myself. Does the above sound like the experience most women have when a big baby is predicted? Let’s ask some real life women shall we? Here I am indebted to the fabulous women on my other Facebook group who have shared their stories with me. I commented that I wondered whether that was the reason the mum above struggled to dilate. Rather than failure to progress perhaps her caregivers should be have been labelled with “failure to encourage”. And what of those women who had not been told to expect a big baby? What can we say in conclusion? When a baby is identified as potentially being “big” are all families given the information that we have discussed here? Do all birth professionals agree with the general thrust of this post or have some important points been missed or misrepresented? And if I have got it all wrong what does that say for the idea of “informed choice”? Because this is my best understanding of the issues following a detailed discussion with experienced birth professionals. 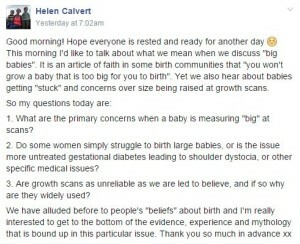 There are plenty of other birth stories from the mums on my group which make it clear that women are routinely being encouraged down the route of induction without fully understanding why, only that baby is going to be “big” and that is some kind of a problem. And so many of these stories end in instrumental deliveries, emergency c-sections and, at worst, traumatic births. 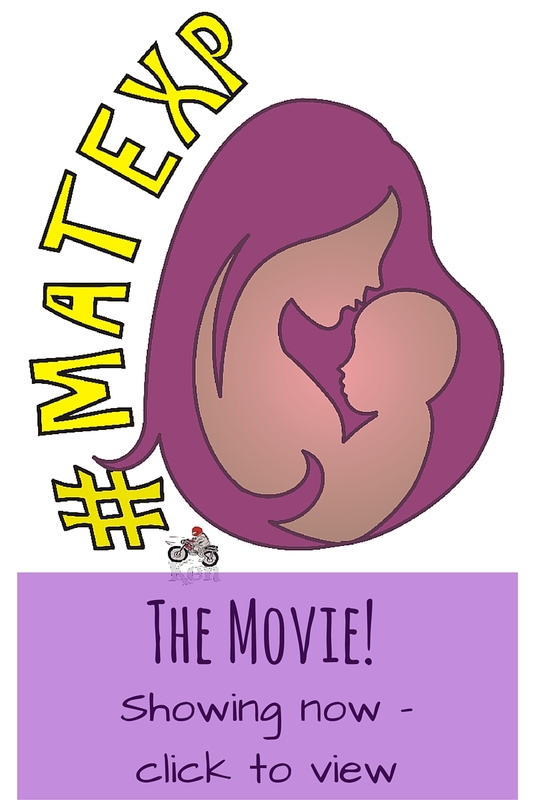 Would it not be preferable for women to have the issues fully explained to them and to be encouraged to have an active birth where, in all likelihood, they will be capable of giving birth to their child? I am just glad that my “big” baby is here, safe and well, and now in his second week at primary school. Decisions always seem simple in hindsight.